As per the 2019 American Express Global Meeting and Events Forecast, meeting room consolidation has created shifts in choice and putting increase pressure on meeting owners and planners. Non-technology alternatives- Over the past 5 years, meeting room consolidation and technology advancements have led to the closing of some corporate computer training centers. As an alternative, meeting planners have moved to non-technology meeting centers and ordered the technology components ala carte. New challenges with non-technology centers include the availability of quality Internet, adequate Internet bandwidth and more complex contractual terms. Many require a deposit when booking and less flexible cancellation clauses. Technology restrictions- For example, many hotels provide Internet access with a password or through their own “splash” page. This can cause problems for some web-based applications or when VPN routers are used by clients. The use of meeting rooms and computer classrooms at colleges and universities has increased, but can come with many more restrictions on availability and scheduling. They may also not allow loading of proprietary software programs. Renting high-technology classrooms- Because ContactPointe is experienced in dealing with the above issues, it is absolutely possible to rent a high-tech classroom or meeting room through us, complete with computers, AV, and Internet bandwidth. ContactPointe will coordinate all of the details for your technology needs to insure a successful event. No solution for live inventory- There is no true live nationwide inventory for high-tech or simple meeting rooms. ContactPointe maintains its internal database which has grown to over 1,000 meeting facilities. We know how to match meeting room requirements, provide the technology and simplify the contractual issues. Finding the right location is the hardest thing you do, and ContactPointe makes it easy. Learn about ContactPointe’s unique ability to handle a large-scale training and technical ERP rollout for Mattress Firm. ContactPointe helped Mattress Firm with their multi-year, 10,000 employee ERP training. It resulted in a seamless transition of personnel training and conversion of their sales data. The final day at each training event and site, the stores would “Go Live”. Pending customer tickets had to be manually entered into the new system in order to schedule deliveries. Up to 3,000 tickets were entered during “Go Live” from each training site in a single day. Training Industry Magazine’s focus this quarter was Evolution of the Classroom. A case study provided a roadmap of tools needed to support both a physical and virtual classroom. These tools integrated engagement, interactivity and live discussions. Improving on audio, visual and content for the virtual learner was key. One take away was to have a train-the-trainer session. Article Train for the Brain, from Training Industry Magazine Winter 2016, applies brain science to workplace learning. For the human brain, the best way to receive training is in a facility where learners can give their undivided attention. Taking that one step further, a dedicated professional training facility maximizes productivity and learning environment. See the comparison of a training facility to hotel space. The right training facility is crucial to an effective training session. It is especially critical that the event venue represents a company’s brand. Customers attending Workiva’s hands-on training make an investment in time, money and knowledge. ContactPointe’s experience and knowledge of setting up quality events met Workiva’s high standards and supports their ongoing 2016 training expansion. Selected as their single provider, Workiva estimates that we’ve saved them 50-70% FTE. Article Training as a Service focuses on creative and adaptive outsourcing. As a training room rental partner, ContactPointe has flexible business practices that support customer requirements to be agile and “just enough”. Specifically, our “ no deposit” and 14-day cancellation policies for classroom rentals benefit a wide variety of our clients. Clients appreciate our role as a partner, not just a supplier. 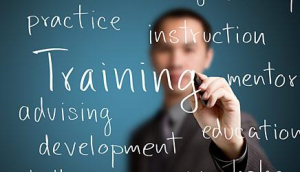 Tips for effective training outsourcing. Tip #8 Run Your Training Offsite to get focus and convey a high priority. Don’t let day-to-day interruptions of an onsite class take the focus from your training investment. Find a training logistics partner to map out an end-to-end plan, execute the many logistical tasks needed to deliver a quality event and measure training event outcomes.